I have a confession to make. Today, I didn’t really want to write. I have had a busy week and a busy morning. I have been writing in my head all week, but hadn’t yet transferred anything to paper. Since I had an unusually busy morning, I was planning on coming home from my meeting and either resting for a minute (I have the unusual opportunity of quiet in my house since I have two kids at school and one with my husband) or getting on the treadmill. However, since I didn’t do my devotional time when I first woke up this morning, I took a slight detour and got out my Bible and devotional, Jesus Calling, instead. And like usual, God always has a way of getting my attention. The very thing that was in today’s devotional was the message I had been preparing in my head all week. One of the sentences in today’s devotional said, “The world’s way of pursuing riches is grasping and hoarding.” Hoarding was the very word that surrounded my thoughts this week. My six-year old daughter has hoarding tendencies. I don’t know why. She just loves stuff. It is not even as though she needs new stuff or toys or jewelry…it is just plain stuff…anything and everything you could imagine (literally, she might have the kitchen sink up there). And, on top of her hoarding tendencies, she also likes to stuff things in purses and bags of all sizes. Her room recently looked as though a bomb went off in there. You couldn’t even see the ground. We thought that if there were a fire, she wouldn’t even be able to carve out an escape route. I tried to be the mean mom and tell her that no one was going to clean that room except for her. Well, after a week or two of this, we still didn’t see any positive result. In fact, it was just the opposite. There was now even more stuff. 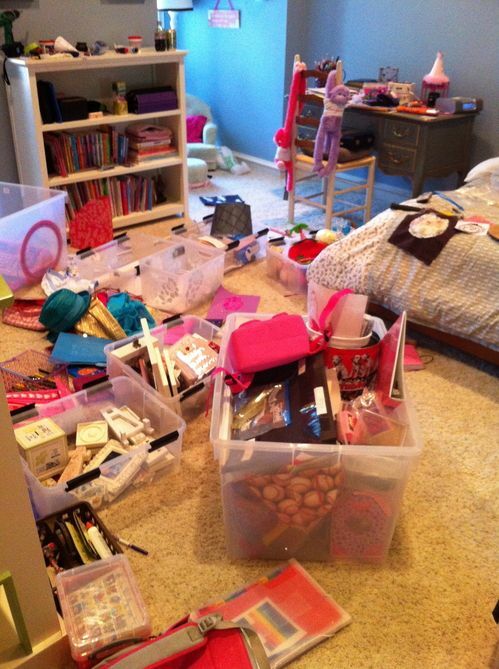 And, I was convinced that her disorganized room was causing her nightmares. So I tried to come up with a solution. I decided to redo her bedroom – fresh paint, new décor, and new paintings on the wall – the whole nine yards. Perhaps, giving her a fresh start would kick start her desire to keep it clean and organized. I also hoped that a clean room would help with her sleeping issues. I really had to psyche myself up for this adventure. I knew that the paint was going to be the easy part. I was dreading hauling everything out of her room and even worse, sorting through all of it, figuring out what needed to go back in and where to put it when it did. I finally just dove in headfirst. I bought the paint last Friday, came home from the store, and started taking stuff off the wall. There was no turning back. And yes, painting was the easy part. That went pretty quickly. However, once the paint dried, the madness had just begun. I had to get everything organized and back into her room because it was spilling into the landing and everyone was now tripping over it. As I sifted through her treasures, I was overwhelmed with the stuff she had. Every time I thought I was making headway, I found yet another bag full of stuff. I even found things she had been looking for, but couldn’t find…imagine that. I carried out four large bags of trash. 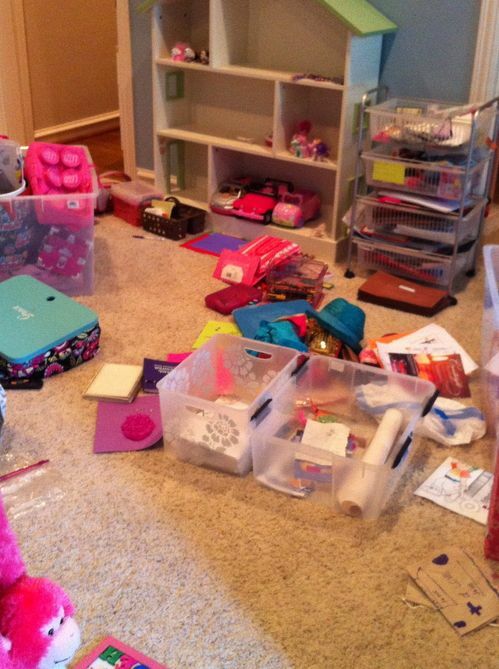 As I sat in her room organizing, I thought of Luke 12:34, “For where your treasure is, there will your heart be also.” I kept thinking that man, this little girl has so much stuff and if she was sitting in here with me, I know she would not be letting me get rid of half of this stuff. And, I was huffing and puffing under my breath at myself because we contributed to her having all of this stuff (although, literally, she is a paperaholic) and because I knew that no matter how many hours I spent organizing this time around, I knew I would be back in here in a couple months doing the same thing again. Clearly, I was grumpy. However, as I sat there wallowing in my own pity, the Lord kept tugging at my heart. He was trying to teach me a lesson through this mess. Yes, it had to do a little bit with what we hold on to and what we accumulate, but it also had to do with the choices we make in life. Sometimes, our lives and the choices we make in them, to Him, look like a bomb went off. I pictured Him sitting in a room going through my life “stuff” and going through the same kind of emotions. Sometimes our life choices are jumbled, messy, and complicated. Our choices cause us to clutter up areas of our life that make it impossible to add anything more or good to them. Sometimes because of our choices, we block paths that don’t let us get out of our current situation. Sometimes because of our choices, we can’t see the beauty and blessing around us because we have lost it or buried it under a pile. Sometimes because of our choices, our clutter spills out into other people’s lives and gets in their way. 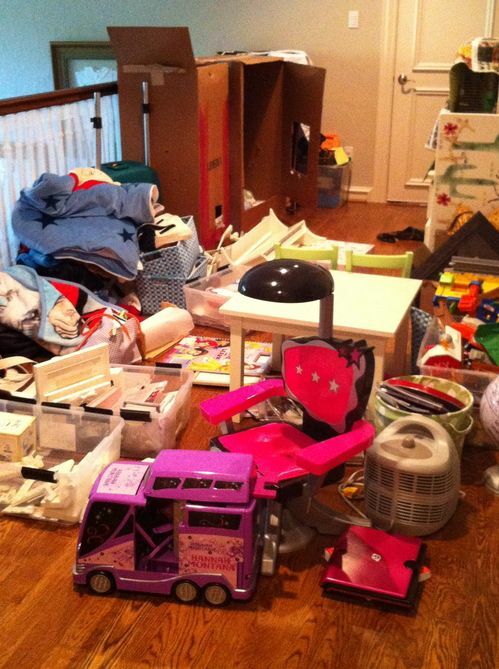 We may not all hoard material possessions, but sometimes our choices and lifestyle are a hoarded mess of bad choices. Hoarders, like any addict, can at some point recognize that they have a problem, but they don’t know how to stop it. Some of us, make so many bad choices that it is almost impossible to get out from under those bad choices. I recently was assigned a mentee through a ministry that I volunteer with. I haven’t known her very long, but from the brief conversations I have had with her, it is hard to not just stop, shake her by the shoulders and say loudly, “Can you not see that the choices you are making are a part of the problem?” I know at many points in my life, I am sure God wanted to do that very thing with me. At some point, each one of us has to take responsibility for our own actions regardless of what has happened in the past or what is happening in the present. We can’t continually blame everything on everyone else, conduct daily pity parties or blame others for our current situation. It just doesn’t work. Just like an addict has to admit first, so too must we admit that we haven’t made some wise choices. Then, just like an addict, we must make changes. Recovering addicts have it tough. They are virtually told that they have to change almost everything – friends, contact with family, if necessary, jobs…anything that has contributed to their addiction. Why then should it be any different for those of us who have buried ourselves in bad choices? Why does it seem irrational to suggest that a complete do-over is necessary, especially in extreme situations? Sometimes, we are called to come alongside someone to help with the mess. Initially, it can be even messier than it was before we arrived on the scene. Sometimes, we are called to not intervene, but instead pray for that person. That’s a hard position, especially if you are a person who likes to fix things. Modeling and praying for that person can be exactly how God wants and needs to use you in that situation. In my daughter’s case, I jumped in and tried to help her out. I cleaned up her mess and put things back in order for her. That’s not always so easy to do. In the case of my mentee, I can’t do that. There are things that are totally out of my control or human capabilities of accomplishing for her. But, I can be an example for her, be a shoulder to cry on and an ear to listen. And, I can pray for her. Proverbs 19:3 says, “People ruin their lives by their own foolishness and then are angry at the Lord.” This Proverb is so true. Not only do we get mad at God, but also we get mad at the people around us. That is a recipe for disaster. It either pushes people away or causes us to just pile on more trouble and drama. Let your storehouse be filled with mighty treasures that are pleasing to God and used for His purposes. Don’t hoard your troubles or your choices so that they take up valuable space in your storehouse. Don’t block your path to and from God. Even if you have a lifetime full of bad choices, nothing is impossible with God (Luke 1:37). Enjoyed reading this and received....thanks.